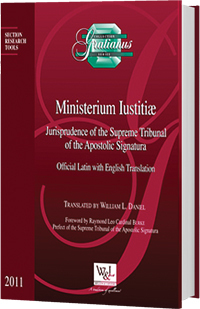 This collection of jurisprudence includes the official Latin text with an English translation by William L. Daniel. The foreword is by Raymond Leo Cardinal Burke, prefect of the Supreme Tribunal of the Apostolic Signatura. This collection spans many topics, including causes of nullity, members of religious institutes, parish priests, sacred places, and discipline and administration within the Church.